Depeche Mode are an English alternative band, founded in 1980, originally from the town of Basildon, Essex, United Kingdom. They are one of the most enduring and successful bands to have emerged during the 80s, and particularly from the new wave/new romantic era. The band name is derived from a French fashion magazine, D?p?che mode, which means "fashion dispatch." The band have been highly influential in the electronic dance music scene, especially synthpop, techno and trance, in part due to their innovative work, recording techniques and use of sampling. The band have been highly influential in the electronic dance music scene, especially synthpop, techno and trance, in part due to their innovative work, recording techniques and use of sampling. Their most successful album is arguably 1990's Violator, which reached the #2 position in the UK, #7 in the US, and sold over 8 million copies worldwide. The band has released a long series of high-charting singles over their three-decades long career. Enjoy the Silence is their most recognized song and is one of the most covered songs in history. 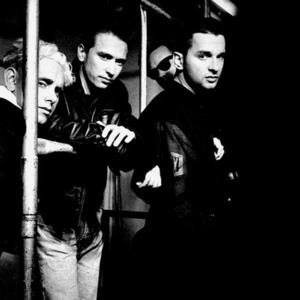 The original line-up was Dave Gahan, Martin L. Gore, Andy Fletcher and Vince Clarke. In December 1981, Clarke left the band and later went on to form Yazoo, The Assembly and Erasure. Alan Wilder joined the group initially in January 1982 as a live keyboardist but became an official member in December 1982. He left mid-1995 to fully concentrate on his Recoil project and the band continued as a trio. In 2010 Wilder re-joined Depeche Mode on stage after 16 years, for a performance of Somebody during a show at London's Royal Albert Hall in aid of the Teenage Cancer Trust. Depeche Mode's origins date back to 1977, when Vince Clarke and Andrew Fletcher formed a band called No Romance in China, with Clarke on vocals and guitar and Fletcher on bass. In March 1980, Clarke, Gore and Fletcher formed a band called Composition of Sound, with Clarke on vocals/guitar, Gore on keyboards and Fletcher on bass. Soon after the formation of Composition of Sound, Clarke and Fletcher switched to synthesizers. Dave Gahan joined the band in 1980 after Clarke heard him perform at a local scout hut jam session, singing to a rendition of David Bowie's "Heroes", and Depeche Mode were born. While playing a live gig at the Bridge House in Canning Town, the band were approached by Daniel Miller, the founder of Mute Records, who proposed them a verbal contract. The result was their first single Dreaming of Me, recorded in December 1980 and released in February 1981, reaching number 57 in the UK charts and followed soon by a real contract with Mute. As of 2006, it was estimated that Depeche Mode had sold over 100 million records (60 million albums / 40 million singles) worldwide and have had 48 songs in the UK singles chart. They are the best selling band to have never had a UK number 1 single. According to Q Magazine, Depeche Mode is "the most popular electronic band the world has ever known."